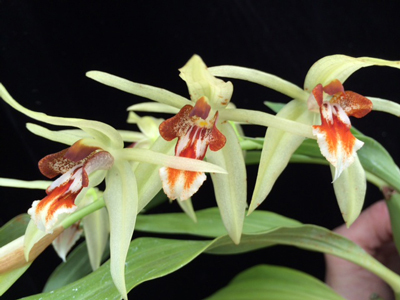 Coelogyne salvaneraniana outcross #2477 ('6764' x 'Cindy') (approximately 25 seedlings per flask). The Species: I bought my plant at the WOC in January 2008. 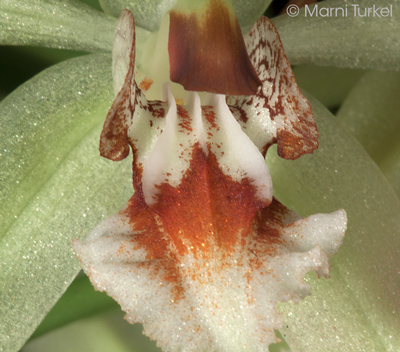 After some years of discussions whether this was a species or a hybrid, it was described as a valid species in 2011. 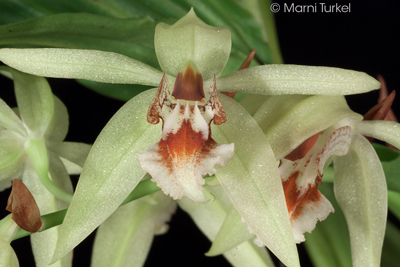 This species is found on Mindanao Island in the Philippines where it grows as an epiphyte at elevations of 2300 ft. The inflorescenc emerges from an expanding new growth and carries up to 8 flowers that are a about 2.25" across. Culture: I have been growing and blooming this speciesin intermediate conditions for almost 10 years. After doing the research for this listing, I will move it into warmer conditions to see if it prefers higher temperatures. I have grown it in moderate light, potted in a fine bark mix in a plastic pot with year round watering and dilute fertilizer.